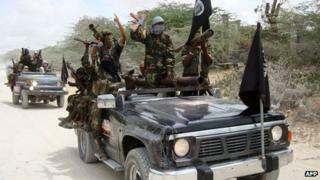 Somali militant group al-Shabab has sent reinforcements to the town of Barawe, where US commandos tried to seize one of its leaders on Saturday, residents have told the BBC. The residents say about 200 masked fighters have arrived in the coastal town with heavy machine guns. The American raid targeted a Kenyan Somali known as Abdukadir Mohamed Abdukadir, alias Ikrima. The operation follows last month's attack on a Kenyan shopping centre. Al-Shabab, which is part of al-Qaeda, has said it carried out the attack, in which at least 67 people were killed. On the same day as the raid in Somalia, US forces seized alleged al-Qaeda leader Anas al-Liby from the Libyan capital Tripoli. He is a suspected mastermind of the 1998 US embassy attacks in Kenya and Tanzania. Barawe residents say Ikrima is an al-Shabab leader with responsibility for logistics, who is usually accompanied by about 20 well-armed guards. Pentagon spokesman George Little said Ikrima was closely associated with Harun Fazul and Saleh Ali Saleh Nabhan, who helped with the 1998 embassy bombings and the 2002 attacks on a hotel and airline in Mombasa. Nabhan was killed in a 2009 US air strike in Barawe. Harun Fazul, also known as Fazul Abdullah Mohammed, was apparently killed by police in Mogadishu in 2011. "While the operation did not result in Ikrima's capture, US military personnel conducted the operation with unparalleled precision," said Mr Little. He said the operation "demonstrated that the US can put direct pressure on al-Shabab leadership at any time of our choosing". According to a Kenyan intelligence report leaked to the US media, Ikrima was planning to attack targets in Kenya last year, including the Westgate shopping mall. British citizen Samantha Lewthwaite was also named as having links to the planned attacks, the report says. Early on Saturday morning the US forces approached a villa near the Indian Ocean coast where Ikrima is said to stay from time to time. As they were putting up a ladder outside the building, a guard reportedly sounded the alarm, leading to an exchange of gunfire which lasted about 20 minutes. The US forces then withdrew to the beach, got into speedboats and returned to a waiting ship, said residents of the town, which is 180km (110 miles) south of the capital Mogadishu. Al-Shabab has said that one of its fighters was killed during the attack. The BBC's Mohammed Moalimu in Mogadishu says that residents are now afraid to use their phones in case they are accused of being US spies. Al-Shabab has controlled the town since 2008. US Secretary of State John Kerry said the operations in Libya and Somalia showed that the US would never stop "in its effort to hold those accountable who conduct acts of terror". The US has a huge military base in neighbouring Djibouti, from where it carries out many of its operations in Somalia. Al-Shabab has been forced out of most of Somalia's major cities in the past two years but it still controls many rural parts of southern and central Somalia. In 2008, al-Shabab commander Aden Hashi Ayro was assassinated in a US air strike in central Somalia. Last year, US Navy Seals parachuted from a plane into central Somalia to free US aid worker Jessica Buchanan and her Danish colleague Poul Thisted. US officials said at the time the two were held by criminals, not Islamists.